These items come into contact with grease, dirt, wax, lubricants, oil, or other contaminants during the manufacturing process or industrial use and are otherwise difficult and tedious to clean. Ultrasonic cleaning systems are more environmentally-friendly than using chemical solvents or hazardous chemicals. These systems use the power of ultrasonic sound waves provided by transducers that convert electricity into intense frequencies that cause the formation and implosion of minuscule bubbles in a liquid cleaning medium. The bubbles perform a scrubbing action that reaches into grooves and hidden parts of products that are immersed into an agitated fluid. The frequency of the sound waves used in the ultrasonic cleaning systems can be adjusted to alter the size and amount of cavitation, or the formation and collapse of the bubbles. Ultrasonic cleaning systems are capable of cleaning individual parts as well as multiple items simultaneously and are used in a variety of commercial and industrial applications. The automotive, pharmaceutical, medical, beverage, electronics, marine, sports equipment, and weapons industries all use large capacity ultrasonic systems to clean products like hard drive components, small automotive parts, and process machine components that have grease or lubricant build up. Smaller models exist for at-home use, which generally involves ultrasonic jewelry cleaning applications. 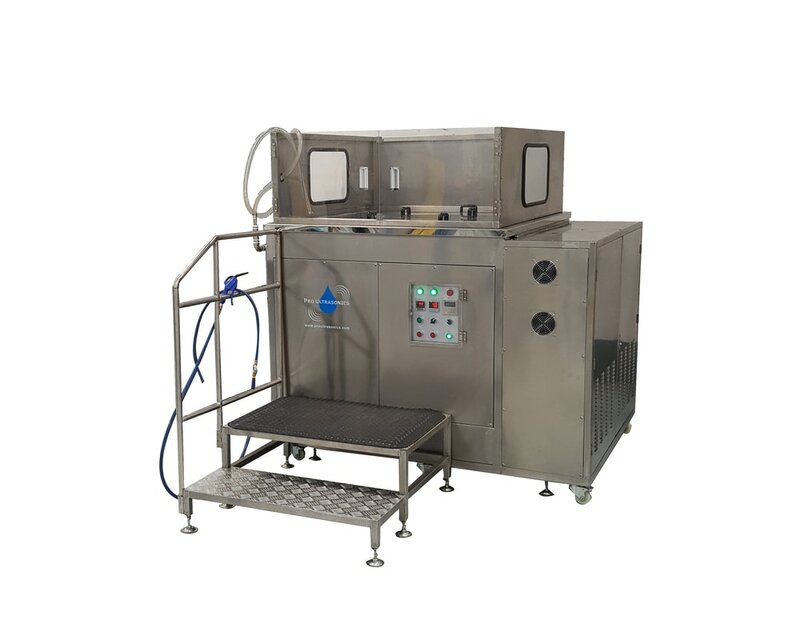 Ultrasonic cleaning systems are composed of a cleaning tank, which is usually made of stainless steel, cleaning fluid, which can be hot water or a water-based solvent, agitators, transducers, pumps or pressure generators, nozzles, and reclamation systems. Many also have drying systems. Larger products are often placed right in the tank, while large amounts of smaller objects are submerged in the cleaning solution in a basket. The ultrasonic cleaning process is fast, automated, and requires little manual labor. It has replaced the traditional methods that used scrubbing with toxic and harsh solvents. In order to ensure that every product’s surface, holes, and cavities are cleaned properly, many systems have rotating parts holders, tumbling baskets, or oscillating systems. Once the products or parts have been immersed in the cleaning solution, ultrasonic sound frequencies cause cavitation, which is the formation and implosion of millions of tiny bubbles in the liquid. When these bubbles implode, a scrubbing action to the product surfaces occurs, ridding them of contaminating substances. Small dirt particles that reside in hard-to-reach crevices are easily purged when using ultrasonic cleaning systems. The frequency of the sound waves used in the system directly influences the number of implosions, so these systems allow for precise control of the cleaning process. Ultrasonic Cleaning Systems Ultrasonic cleaning systems consist of specialized cleaning machines that use high frequencies to clean, degrease, and sterilize a variety of parts, products, and machine components.